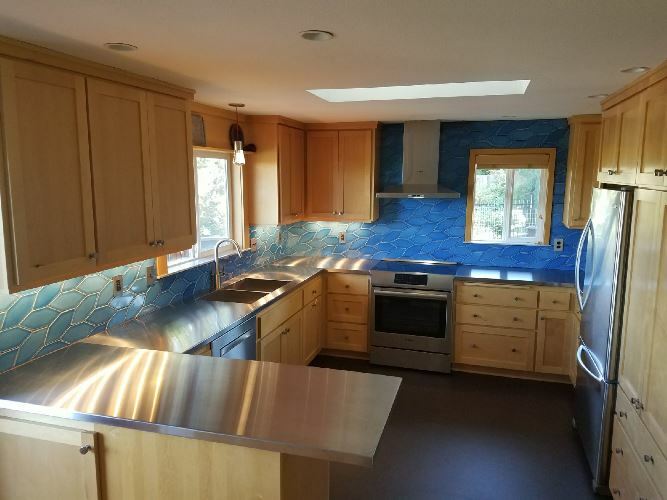 This Corvallis kitchen has captured our imagination! 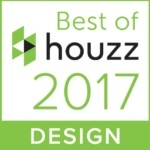 In many ways, this newly remodeled kitchen is a simple design, but the material selections and design subtleties make it a much more exciting and functional kitchen than previously. We only slightly enlarged the kitchen, so this is mostly a replace-in-place design: appliances and plumbing remained in the same locations. But first, the shiny and colorful aspects! The kitchen is graced with stainless steel counters. We designed them with a custom integral sink and a recessed drain board (on the right side of the sink above). One end of the counter is cantilevered to allow for a bar stool to be pulled up for a helper or guest, or just for oneself while reading today’s cookbook. 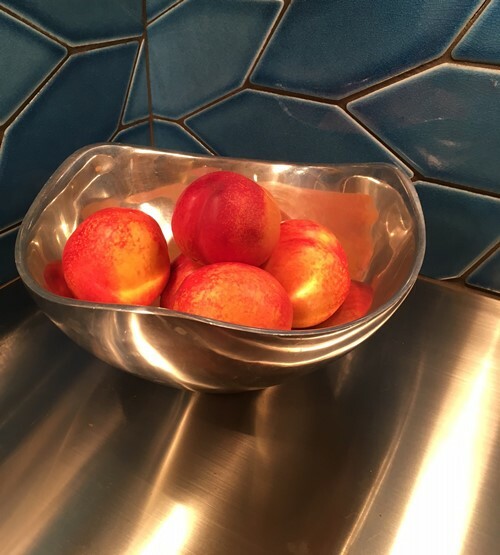 The backsplash is a Fireclay Tile in their ‘Picket’ shape set in a ‘braid’ pattern that lends a sense of visual movement. 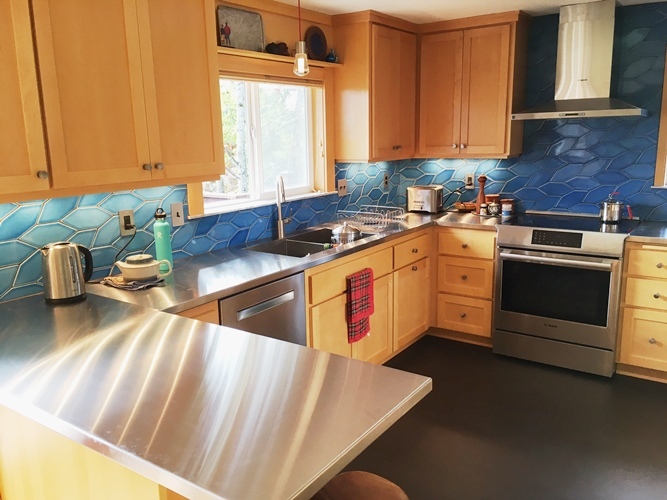 The color is Aegean Sea blue, and gives the kitchen a wonderful depth and vibrancy – especially with the natural maple cabinets. The tile has a crackle glaze and is paired with black grout. At the window sills, we used blue-gray Carrara marble, which contrasts with the cool stainless counters. 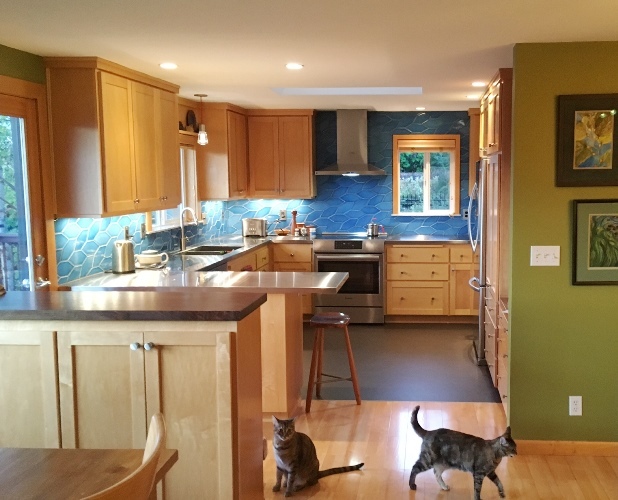 The kitchen contains mostly new cabinets, but these were all made, remarkably, to match the existing cabinets in style and color. Our cabinet maker showed off his skills in color matching here, to the point that it’s difficult to separate new from old! Both new and existing cabinets were outfitted with lots of accessories that make for an efficient kitchen that’s a joy to cook in. Let’s take a peek inside! 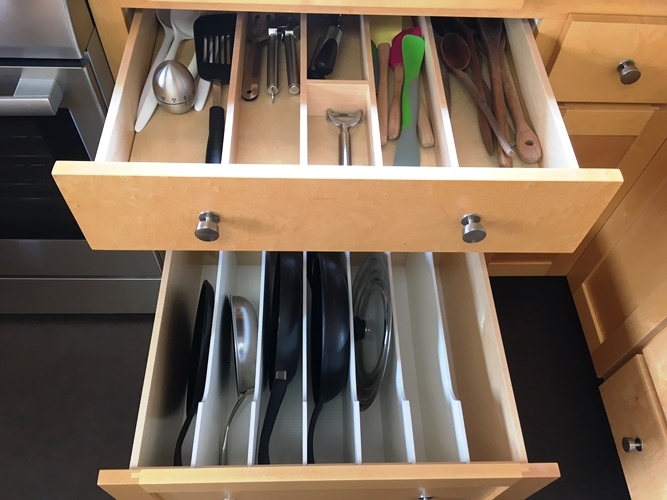 We also added a corner lazy Susan cabinet, a trash and recycling drawer, a pull-out bread board, tray storage above the fridge, and a two-tiered cutlery drawer. 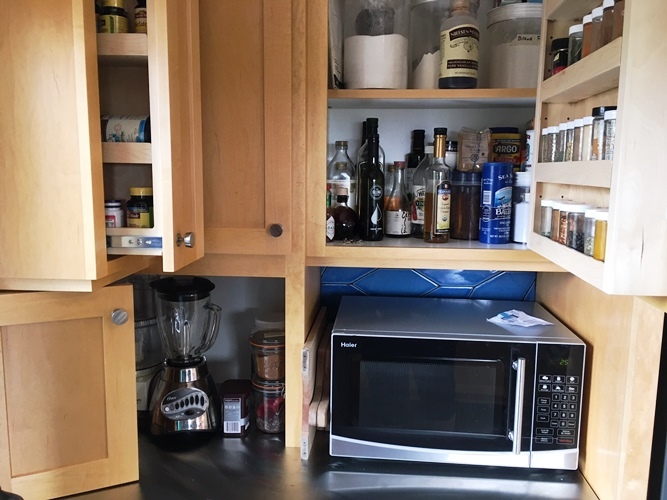 Because of careful attention to the homeowner’s specific storage needs, the kitchen is now far more efficient and less cluttered than the one it replaced – though it grew only a foot or so larger. The homeowner has enjoyed all the clever new accommodations and accessories! We also added a new top to an existing cabinet that acts as a buffet, separating the kitchen from the dining area. The top is a slab of Oregon-sourced Black Walnut, and has amazingly beautiful figuring in its natural grain patterns. 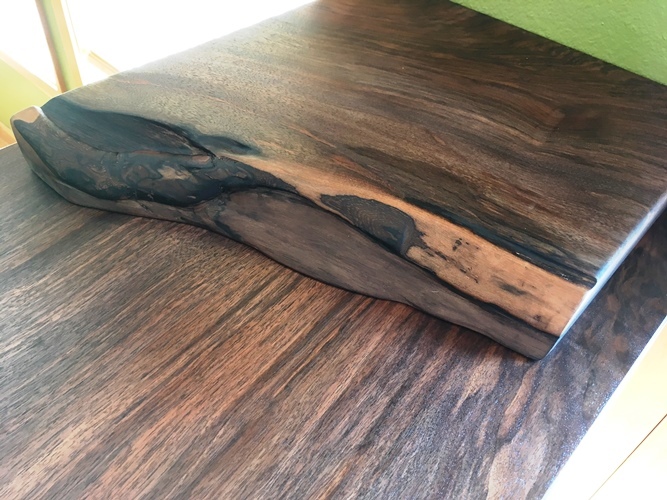 At another location, we topped a desk countertop with a slab of English Walnut. The addition of natural materials like wood and marble lend balance to the more industrial stainless steel of the counters and appliances. Marmoleum (a true, natural linoleum sheet flooring) replaced the worn and tired hardwoods that were in the original kitchen. The shift in materials between the kitchen and dining room provides a welcome visual separation in the open floor plan of the spaces. In the picture below, the black walnut slab counter can be seen in the foreground. 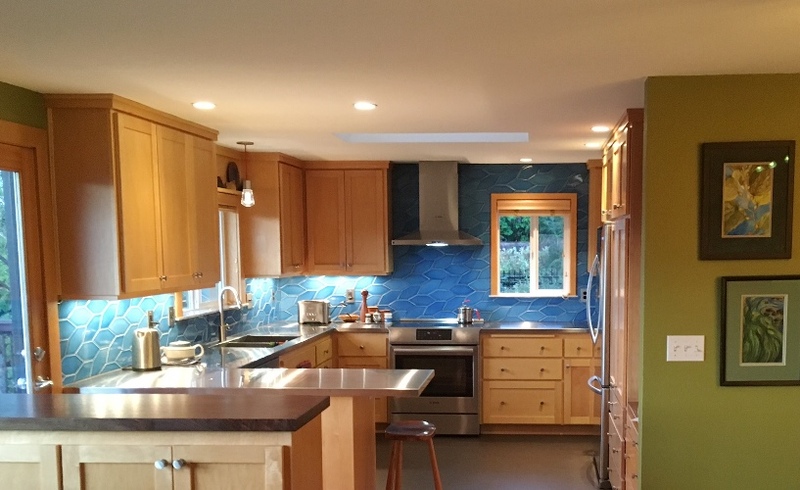 Beyond, under-cabinet lighting brightens the work space and highlights the handmade tile. 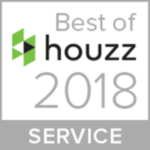 The success and beauty of this kitchen is a direct result of close collaboration with a homeowner who has a particular vision and a discerning eye. She envisioned the stainless steel, the tile, and so much more, while we finessed, facilitated, and fabricated to bring it all to fruition. We are honored to have been part of the team!